The Return to the Tomb of Horrors was written and released some twenty years after the initial Tomb of Horrors. 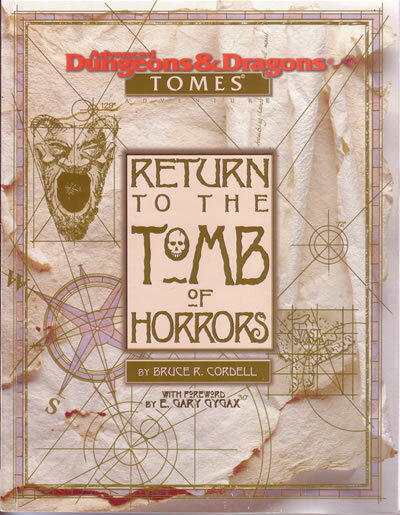 The Return was to be an event; one of TSR’s (now owned by Wizards of the Coast) last boxed sets, it contained a book for the main adventure (printed in two colors), a booklet of maps and monsters (printed in color), a small journal from a previous survivor of the tomb, and a color card of art. Where the original adventure looks very much like it was typed out, twenty years had brought a fair amount of progress to desktop publishing. Return is printed in two colors, with border art and a watermark. This makes it more visually pleasing, but I can’t really say it improves the adventure itself. Return to the Tomb of Horrors has a very late nineties feel. Dungeons and Dragons had expanded enormously from its original days of a largely terrestrial combat encounter game to setting within a larger multiverse with dozens of planes that could be visited. Multiple campaign settings had come been published, including the dimension-hopping Spelljammer, which took place on sailboats that plied the spaceways between magical stars. There are unfortunate aspects to the period, also. The term ‘demon’ is never used in the text. Following the Satanic Panic of the late 80's, the term demon was replaced with tanar’ri. Because if you change something’s name, you change its nature, right? Second edition mega-adventures don’t start at the door of the dungeon. Return has two adventure sections before the adventurers even reach the Tomb. The lead-up provides the adventurers with information concerning the ultimate end of the adventure, as well as a string of clues that get them to the tomb without the GM having to say “You arrive at the Tomb of Horrors.” As someone used to the investigative play style of Call of Cthulhu, I find the clues that link the plot to be fairly weak and easily missed. The adventure does have a fairly grand plot behind it. The original Tomb simply had the trap-laden tomb with Acererak waiting passively in the middle. The Return features a grand plan of apotheosis for the lich, interplanar locations, a spooky city in the midst of nowhere, and a second dungeon-style Tomb, the Fortress of Conclusion, out in the planes. The Return shows how much Dungeons and Dragons had changed in twenty years. Now there was a great deal happening behind the scenes of the adventure, which the adventurers would only become aware of as they progressed in the adventure. Acererak now had a background that could be learned, and an overarching plot that had to be foiled. The characters’ motivation is no longer “treasure” or “because it is there” but because very bad things will happen if they do not pursue the adventure to the end. The Return also encompasses the original Tomb, giving it a sense of continuity. Return is literally built around the original tomb, creating a continuity from the old adventure to the new. I can’t view it as pastiche, because it expands on the original adventure, retaining certain iconic elements (the Green Devil Face, for example) while introducing a far more than the first adventure. Although the Return also includes a booklet of images to show the players, these are poorly chosen. The originals were there to hand clues to the players. These are much less necessary. Do we really need a drawing of a room with a dirt floor and three coffins? Or a walkway stretched over a room full of bones? Ultimately, The Return to the Tomb of Horrors is a reasonably satisfying continuation of the Tomb of Horrors. The traps are less crazy deadly; there are few “characters are dead, no saving throw” traps. It’s a good read, longer than the original, with a lot more change of setting, and much more plot. It has a lot more polish, but in places seems to lack the ferocious creativity Gygax put into giving the players, and their characters, a real challenge. After watching and really enjoying Aliens, I decided to try the newest series in the franchise, AVP, Aliens Versus Predator. This was not a mistake, because it did not waste a lot of my time, and it gave me something to write about. I made it to the second scene, at which point, the film strained my credulity beyond my interest in continuing. Here's the scene: An ice-climber in Nepal. We are told this on-screen. Nepal. The ice-climber's phone rings. I live in Vermont, and there are places where you can't get cell reception. I seriously doubt that there is good cell coverage in Nepal, let alone on isolated ice flows. Strike 1. And then the ice-climber, hanging on a vertical ice flow, answers the phone. Yes, this was pretty inevitable when the phone rang, because it doesn't do to have a phone ring and no one answer it. But it just heightened the unfolding absurdity. Ice-climbing alone, and answering our cell phone as if it were a priority. Strike 2. The third insult, and the point at which I turned the film off, was the "awesome reveal" at the end of the scene. After having a conversation with the person on the other end of the line, the ice-climber decides to go meet with the person who has called her. And she climbs to the top, and it is revealed that the guy she's on the phone with is up there, with a helicopter, ready to whisk her away. This is another example of a tiresome trope of "What happens off-screen is silent." You can't sneak up on anyone with a helicopter, especially not somewhere as silent and abandoned as an isolated ice-flow a few days from civilization. Are we to believe that he flew in while she was sleeping and set down? That he's got a cool stealth-copter? That he flew in, landed, and she just didn't notice? The scene is clearly intended toward the reveal of the helicopter already being there, impressing us with the Company's reach and grasp. Nowhere is beyond the Company's grasp, and they've got the resources to find you no matter where you are. But the scene doesn't make sense if you think about (yes, I understand that's a problem) what had to happen off-screen to make the scene work. And that attitude, in my experience, does not make for a good script. So goodbye, AVP, it was time to watch a film with a better thought-out script.